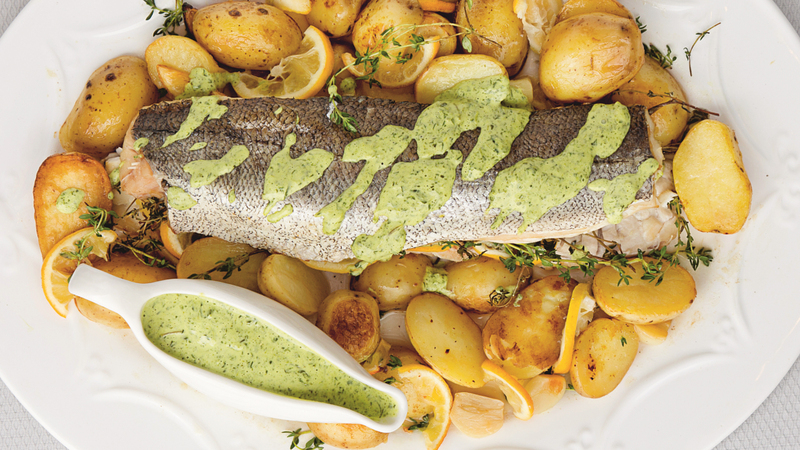 For even more of a wow factor, you could make this same recipe using a whole fish instead of two fillets. 2. Rub the skin of both hake fillets with a little of the olive oil and season well with salt and pepper. Put one of the fillets in a roasting tin, skin side down, then scatter over half of the garlic, a sprig of thyme and half of the lemon slices. Put the other hake fillet on top, skin side up, to sandwich them together. and toss to combine, then scatter around the fish in the roasting tin. 4. Transfer the tin to the oven and roast for 15 to 20 minutes. The fish should be opaque and flaky when cooked through. Meanwhile, put the egg yolks, vinegar and mustard in a blender. Blend for about 5 seconds. Put the butter in a glass measuring jug, then microwave for about 1 minute, until completely melted and hot. 5. Put the blender on high speed and slowly pour the hot melted butter into the egg yolk mixture in a thin stream. Add the rocket, spinach and watercress leaves by the handful, blending between each handful until smooth. 6. To serve, carefully transfer the hake to a large serving platter, surrounded by the roast potatoes. Drizzle some of the sauce over the hake. Serve the rest alongside the fish and potatoes in a gravy boat.